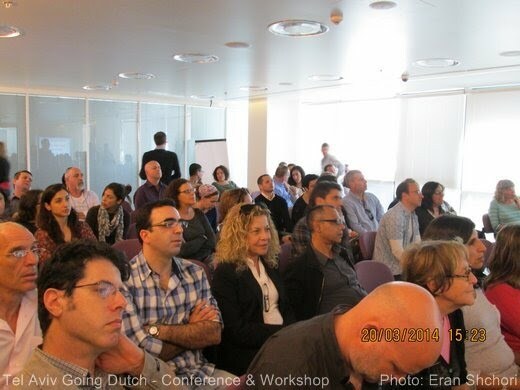 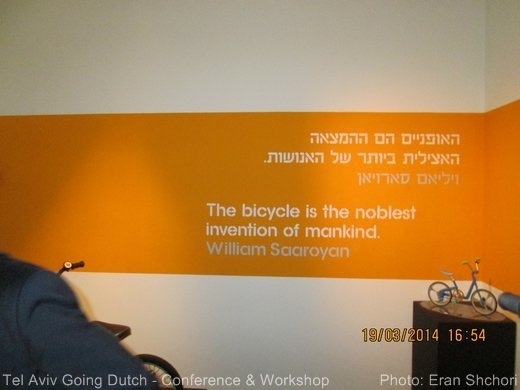 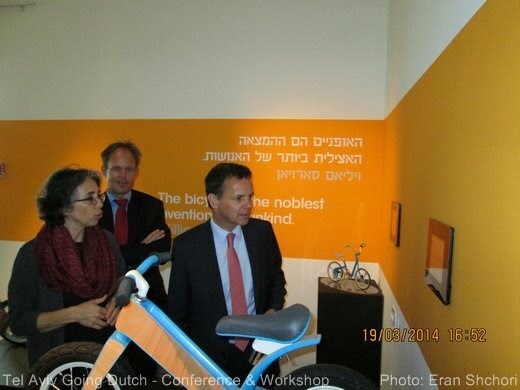 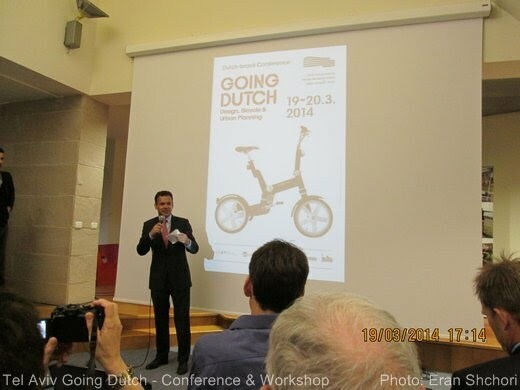 A two day bicycle mobility conference was organized by the Dutch Embassy and the Municipality of Tel Aviv, 19-20 March 2014. 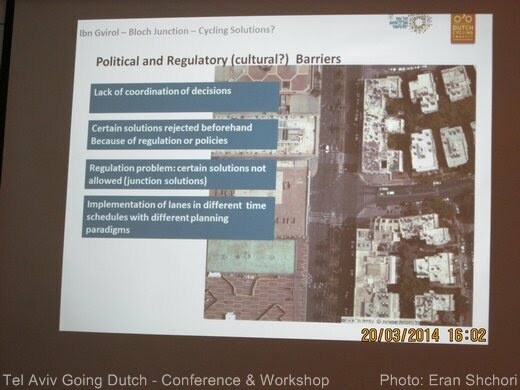 During the first day, two bicycle consultants visited Tel Aviv, examining its bicycle infrastructure. 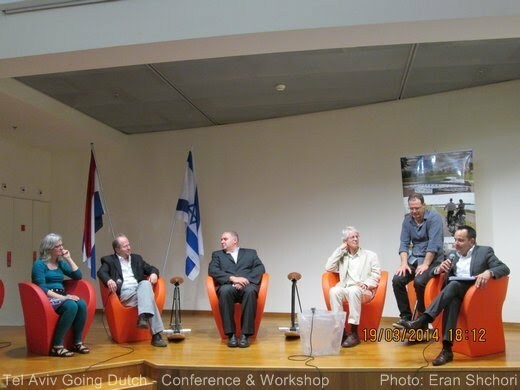 In the afternoon, there was a panel discussion, hosted by the Holon Design Museum. 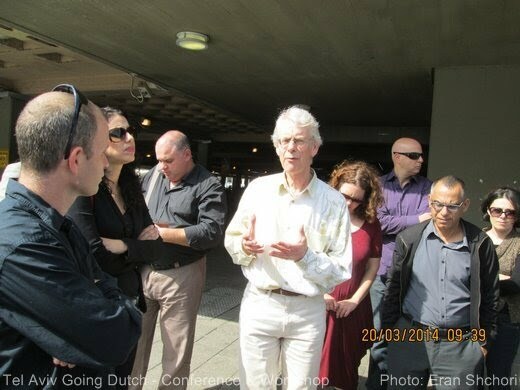 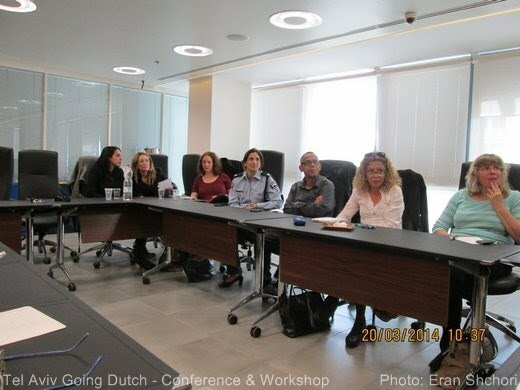 The Ambassador of the Netherlands attended the event as well as officials from the Ministry of Transportation, Ministry of Tourism, Tel Aviv Municipality and other municipalities. 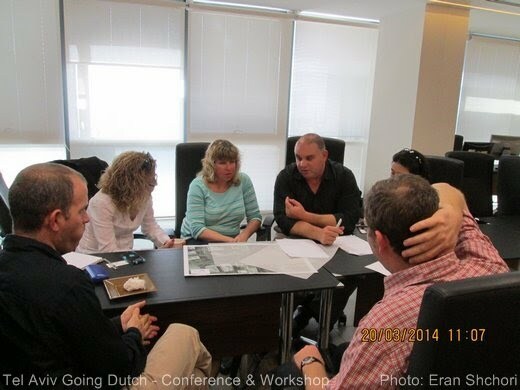 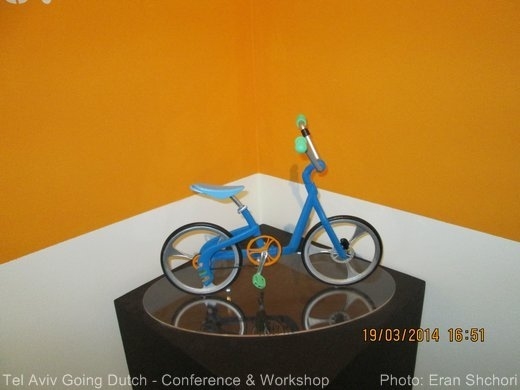 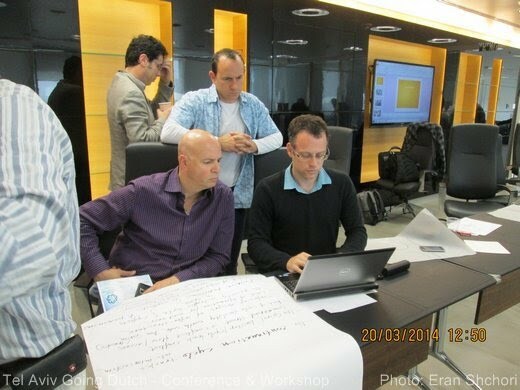 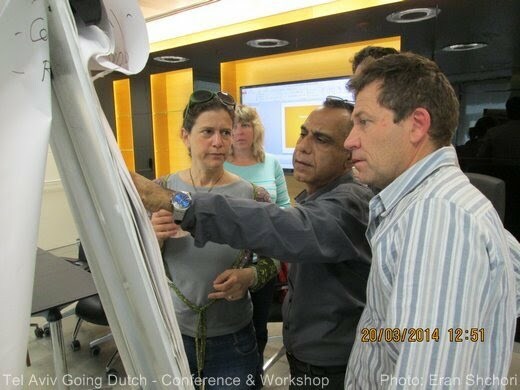 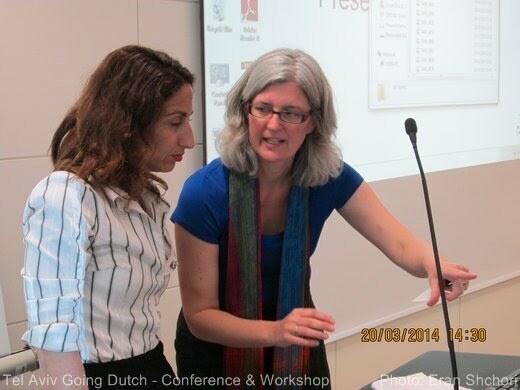 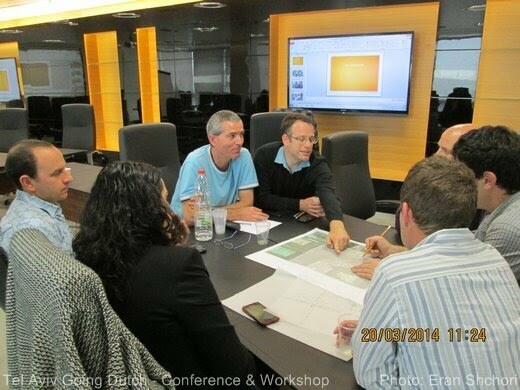 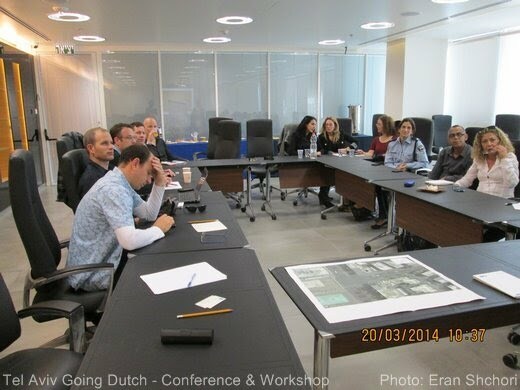 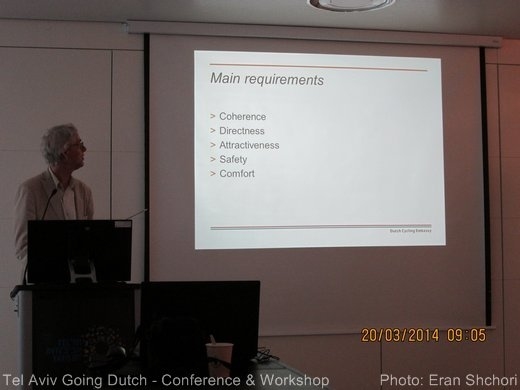 During the second day, two workshops were conducted by the Dutch consultants. 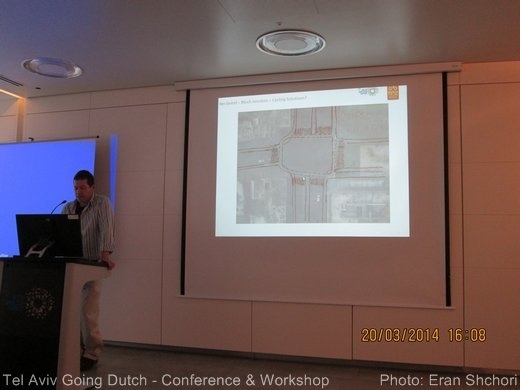 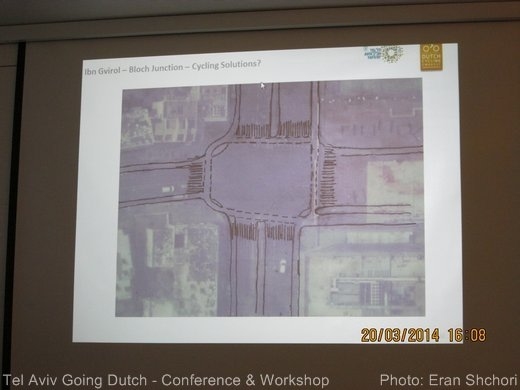 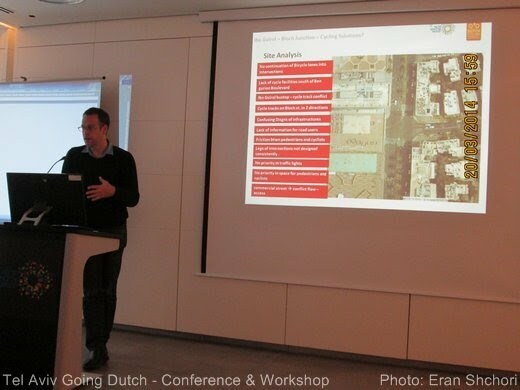 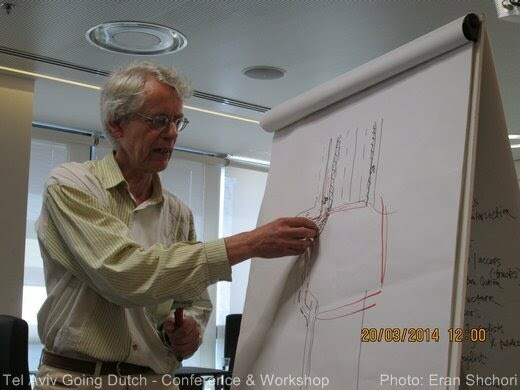 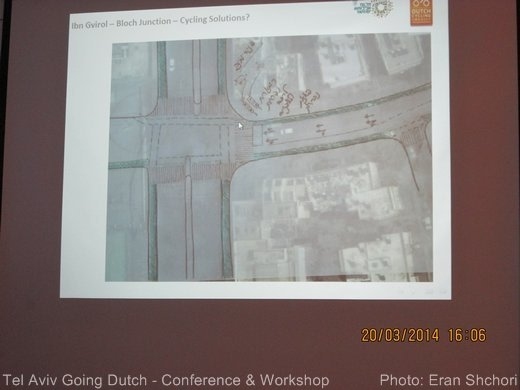 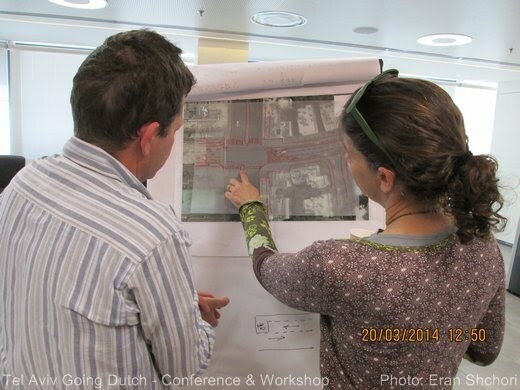 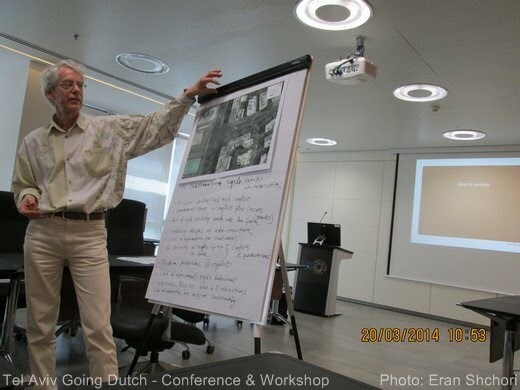 The first workshop, led by Tom Godefrooij from the Dutch Cycling Embassy, looked at junction planning. 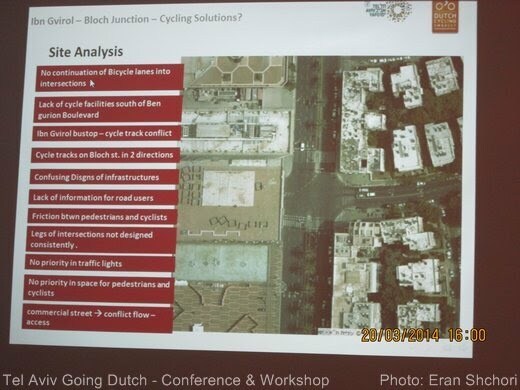 During the workshop we examined the Ibn Gvirol - Bloch junction (just outside the city hall) and offered alternate design that would be better for bicycle transportation. 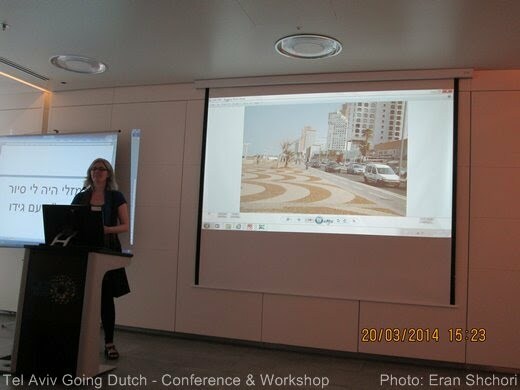 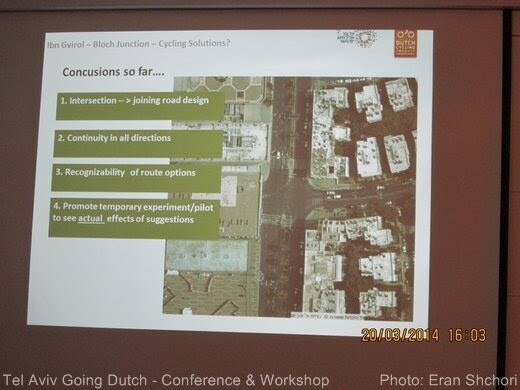 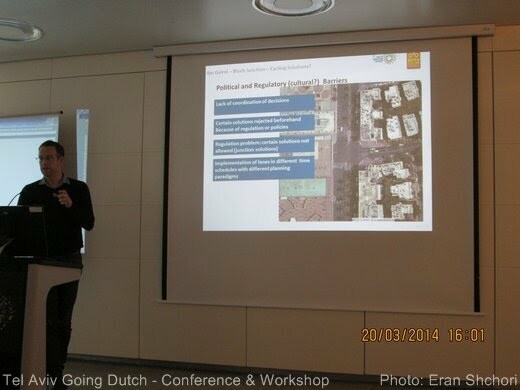 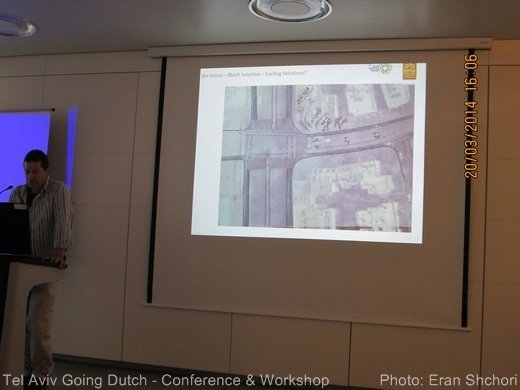 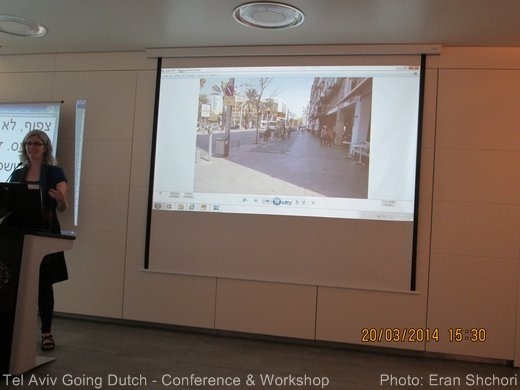 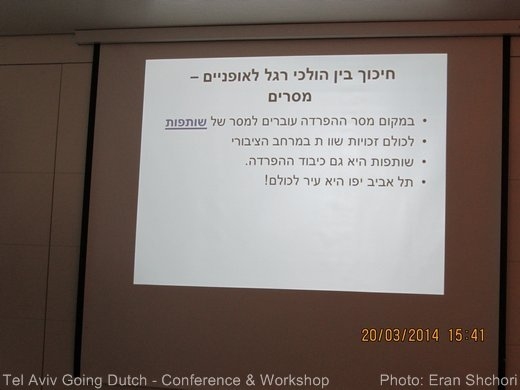 The second workshop, led by Angela van der Kloof looked at the challenges cyclists in Tel Aviv are confronted with due to its cycling infrastructure design, conflicts with pedestrians, solutions.